Survivors of a car crash that killed two members of a California family when a Firestone tire blew out on a Ford Explorer in Wyoming reached a settlement of a lawsuit against the companies Tuesday. The family's lawyer, Laurie Quigly, said her clients agreed to a confidential settlement. The pact was brought before a Superior Court judge late Tuesday morning. The settlement aborted what would have been the first California trial related to the nationwide recall two years ago of Bridgestone/Firestone tires and Ford Explorers equipped with those tires. Opening statements were scheduled this week. Ford spokeswoman Angela Coletti said the company agreed to the settlement but would not comment further on the case. "Our priority is always to do what is best for our customers and our shareholders. We respect the right to privacy of the Meek family and will not discuss details of the Meek settlement," she said. Messages seeking comment were left with Firestone. Garry Lynn Meek and his 13-year-old granddaughter, Amy Meek, were killed Aug. 16, 2000, near Big Piney, Wyo., after the tread of a Firestone tire separated on the left rear tire of the Meeks' Ford Explorer, causing the vehicle to roll, authorities said. Garry Meek, a former police chief and school board president in Farmersville, near Fresno, was killed in the accident. Amy Meek died at a hospital. Meek's wife, Jeanette Meek, was driving and survived. Her son, daughter-in-law and another granddaughter followed behind in another vehicle and witnessed the accident. The trial would have been California's first relating to the nationwide recall two years ago of Bridgestone/Firestone tires and the rollover of Ford vehicles equipped with those tires. In lawsuits filed elsewhere against Ford and Firestone, the companies have settled before verdicts could be reached. Representatives of Ford and Bridgestone/Firestone have said the companies maintained that prior damage to the tire caused the accident. Ford has contended the tire had three prior punctures, three improper repairs and a slice in the side wall. More than 250 people were killed and hundreds more injured in accidents involving Bridgestone/Firestone Inc. tires. Most of the accidents involved Ford Explorers and tires losing their tread. In August 2000, the Nashville-based tire company recalled 6.5 million ATX, ATX II and Wilderness AT tires, many sold as standard equipment on Explorers. In November 2001, state attorneys general across the nation announced that Bridgestone/Firestone would pay $41.5 million in a settlement to end state lawsuits over the tires. 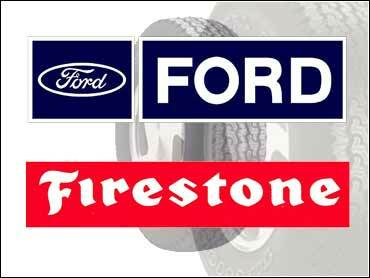 Bridgestone/Firestone has said Ford's recommended inflation rate was too low and contributed to tire failures. Last year, the two companies ended a nearly century-long relationship. On Friday Ford appealed a Fresno state Court of Appeals decision to reinstate an unrelated $290 million verdict handed down in a 1999 case involving the deaths of three people riding in a Ford Bronco.